Receive a warm welcome upon arrival in Bangkok. Transfer to hotel. Freshen up yourself to start the excursion. 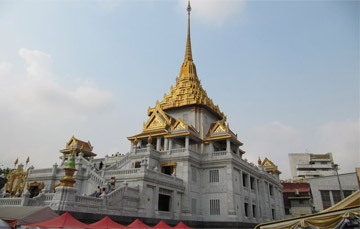 Start off your temple excursion from Wat Traimit, the Temple of the Golden Buddha. The whole excursion would include the most famous temple sites in Bangkok like Wat Arun, Wat Po, Wat Phra Chetuphon, Wat Phra Kaew etc. All of the glorious temples are included in the itinerary and will be covered one after the other. After completing the temple excursion come back to hotel. Start your early excursion with the most prominent floating market of the country - Damnernsaduak Floating Market. Explore the unique lifestyle of the locals and indulge in some souvenir shopping. Return to hotel and pack your bags to take a flight to Chiang Mai. Receive a warm welcome at the Chiang Mai airport. Transfer to the hotel. Freshen up yourself and pay a visit to the Doi Suthep Temple which is one of the most sacred temples in Chiangmai - Wat Phrathat Doi Suthep. Return to hotel in the evening after the visit. Relish in a savory dinner "Khantoke Dinner" while enjoying the hill tribe dance. Start your early morning excursion with the Elephants Camp and explore the elegant elephants at work in the woods. Further, enjoy an elephant ride followed by an Ox-Cart ride. Have a splendid time with bamboo rafting along Mae Taeng River after the ride. Have a relishing lunch at the elephant camp. Head towards the Golden Triangle post-lunch. It is a place where you can explore the glorious borders of the three countries Laos, Myanmar & Thailand. Further, the excursion will take you to the Opium House where travelers can enjoy Opium routing, the history, galleries, accessories and etc. Leave the hotel to catch the flight to Phuket on time. Receive a warm welcome at arrival. Transfer to hotel. Refresh yourself and start a Full Day excursion with a speed boat trip from Chalong Pier to Phi Phi Island. One can enjoy a number of activities here apart from swimming like snorkeling and feeding fishes at “Loh Samah Bay”, indulge in sightseeing at Pileh Cove and Viking Cave etc. Have a relishing Lunch at Phi Phi Don. Enjoy swimming with azure water and snorkeling with copious coral reefs and feeding fishes at Monkey Beach. 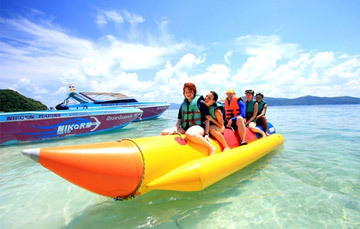 Further, head towards “Khai Nok Island” and have a leisure time with sunbathing, swimming, water sports etc. Start your day with having some leisure time in hotel. Transfer to the airport to catch the flight to Bangkok on time.